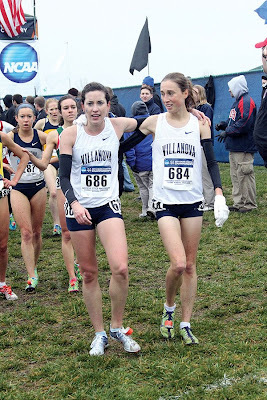 The NCAA East Regional ended well for Villanova this evening as both Bogdana Mimic and defending NCAA champion Sheila Reid qualified for NCAA Nationals in the 5000 meters. Mimic ran in heat 1 and stayed at the front of the pack throughout, cognizant of the fact that the top 5 finishers in each heat qualified automatically for Nationals. Mimic came through to finish 5th, running 16:28.14 in a very economical fashion. The defending NCAA champion in this event, Sheila Reid was part of a three-person breakaway that stretched out the field in heat 2. Emily Sisson led throughout the race, with Reid sticking to her heels until approximately 800 meters remaining. Her spot among the top 5 firmly secured, Reid did not contest Sisson's surge and coasted home safely in third place, in 16:13.47 (recall that Reid was 4th in her Regional qualifier last year). Overall, an excellent final day of the regional. Villanova successfully qualified 4 of their 5 competitors today: Sam McEntee in the 1500, Shericka Ward in the 100 meter hurdles, and both Mimic and Reid at 5000 meters. Add those names to Sam Ellison, who qualified yesterday in the 800 meters, and Villanova will send 5 athletes to Des Moines in two weeks for a shot at national glory.